Nathan Hodge writes for Danger Room, Wired's national security blog. He is the author of The Armored Suburban, a forthcoming book about the military and nation-building. On February 25 journalist Thomas Ricks published an important scoop on his blog at ForeignPolicy.com: Army Gen. Raymond Odierno, the top US commander in Iraq, had requested keeping a brigade in northern Iraq beyond President Obama's deadline for the withdrawal of combat forces. The timing of the story was intriguing. Just two days earlier, Ricks had published an op-ed in the New York Times calling for US troops to remain in Iraq long term. "I think leaders in both countries may come to recognize that the best way to deter a return to civil war is to find a way to keep 30,000 to 50,000 United States service members in Iraq for many years to come," he wrote. The op-ed coincided with a policy brief by Ricks issued by the Center for a New American Security (CNAS), the Washington think tank where he is a senior fellow. 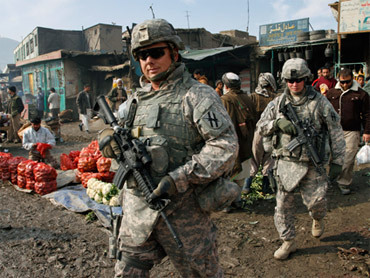 Ricks, a longtime military correspondent for the Washington Post and the Wall Street Journal and author of the bestseller Fiasco: The American Military Adventure in Iraq, had been a prominent critic of US policy in Iraq. Recently on his blog, he called the decision to invade "one of the biggest blunders in American history." But his op-ed, along with the rollout of the policy brief and the news story, was selling the idea of a long stay in Iraq. CNAS, like most think tanks, bills itself as "independent and nonpartisan"; its leadership says that it takes no positions as an institution. But it played a key role in selling the escalation of the war in Afghanistan, and now it could help prepare the ground for the president to reverse course on Iraq and keep a large force in the country. It's part of a new influence game in Washington. Think tanks, once a place for intellectuals outside government to weigh in on important policy issues, are now enlisted by people within government to help sell its policies to the public, as well as to others in government. Institutions like CNAS are also heavily funded by major weapons manufacturers and Pentagon contractors, creating potential conflicts of interest rarely disclosed in the media. Indeed, the presence of journalists on the payrolls of think tanks is crucial to their clout, lending them the imprimatur of neutral, nonpartisan news organizations. Since its founding in 2007, CNAS has played host to a string of reporters from major US newspapers: Ricks worked on his most recent book, The Gamble, at CNAS; Post reporter Greg Jaffe and former New York Times reporter David Cloud worked on The Fourth Star, a book profiling four Army leaders, while in residence; Thom Shanker and Eric Schmitt, veteran military and intelligence reporters for the Times, are researching a book on counterterrorism there. And CNAS isn't the only place where national security reporters have set up shop. Times military correspondent Michael Gordon is a senior fellow at the Institute for the Study of War (ISW), a new think tank founded by Kimberly Kagan, the wife of Fred Kagan of the American Enterprise Institute (AEI) and a cheerleader for the "surge" strategies in Iraq and Afghanistan. As newspapers close foreign bureaus and shrink newsrooms--threatening independent national security reporting at a time when the United States is involved in two wars--think tanks like CNAS have moved to fill the void in new and old media. And while tightfisted newspaper publishers may be less than generous with book leave, think tanks like CNAS and ISW offer a place to work on long-form journalism free of daily deadline pressure. What enables journalists to make the leap to an institution like CNAS is its carefully cultivated image of bipartisanship. Its board of directors includes prominent Democrats and Republicans, which makes it easier to get past the standards editors. "I could go there without being branded," Jaffe told me. "It would have been a tougher sell to my bosses to go to AEI or the Center for American Progress." Schmitt made a similar argument. "We've tried to keep our reporting middle-of-the-road, for our careers, and I think we were looking for an institution that would reflect that," he told me. At first glance, it's an ideal arrangement. Jaffe and Cloud's book, for instance, was a fairly measured portrait of top leaders like Gen. David Petraeus, and, more important, CNAS doesn't dictate the journalists' views. "CNAS had zero control or influence over the book's content," Jaffe wrote me in an e-mail. "We got a small travel stipend ($5,000 each) and office space, but that was it." But Jaffe's argument begs the question of whether think tanks, even centrist ones, truly offer the same independence that newspapers purport to have. CNAS is an instructive case. Two former Clinton administration officials, Michèle Flournoy and Kurt Campbell, founded CNAS in 2007 as a way for centrist Democrats to reclaim a place in the national security debate ahead of the 2008 presidential race. It was an expert triangulation: Flournoy, Campbell and their associates staked out a hawkish (or, as they would term it, a "pragmatic and principled") position on Iraq, opposing early deadlines for withdrawal. After Obama's election, CNAS would emerge as a key feeder for the new administration's national security team. No fewer than fourteen CNAS grads would land slots in the Defense and State departments. Flournoy now occupies the number-three post at the Pentagon, and Campbell is the head of the State Department's Asia bureau. How exactly did Flournoy and Campbell conjure up a think tank out of thin air? In addition to support from foundations like the John D. and Catherine T. MacArthur Foundation, the William and Flora Hewlett Foundation and the Ploughshares Foundation, CNAS received heavy backing from the military industry. Its list of donors includes major weapons manufacturers like Boeing, Lockheed Martin, General Dynamics, Raytheon and BAE Systems. It also receives contributions from private security firms like Aegis Defence Services, as well as from KBR, the logistics support contractor notorious for overbilling the Pentagon for its services in Iraq and Afghanistan. And it generates income from research contracts with the Pentagon and intelligence agencies, as do others like the Center for Strategic and Budgetary Assessments. CNAS has also emerged as an important conduit for military commanders to reach key audiences and set the terms of the debate in Washington. When Gen. Stanley McChrystal decided to launch a sweeping, top-down review of Afghanistan strategy, he invited CNAS's Andrew Exum, who served in Afghanistan and Iraq, to join his assessment team. Exum was not the only think tanker who took part in McChrystal's surge of policy nerds. As part of his review, McChrystal reached out to a small but influential circle of national security wonks, including Fred Kagan (AEI), Kimberly Kagan (ISW), Stephen Biddle (Council on Foreign Relations), Anthony Cordesman (Center for Strategic and International Studies) and Jeremy Shapiro (Brookings Institution). It was a calculated exercise in bipartisanship, but it was also a smart PR move: upon returning from their Pentagon-organized visit to Afghanistan, many of the participants in the strategic assessment would serve as an advance guard for McChrystal's upcoming request for a significant increase in troops and resources. On January 4 the top US intelligence officer in Afghanistan, Maj. Gen. Michael Flynn, issued a scathing report on the state of intelligence in Afghanistan. "Eight years into the war in Afghanistan, the US intelligence community is only marginally relevant to the overall strategy," the report said. "Having focused the overwhelming majority of its collection efforts and analytical brainpower on insurgent groups, the vast intelligence apparatus is unable to answer fundamental questions about the environment in which US and allied forces operate and the people they seek to persuade." In other words, the military was clueless about Afghanistan's cultural terrain, economic development and local power dynamics. It was a damning assessment, but Flynn's critique caused a major stir in military circles for another reason. Instead of distributing it as an internal memorandum, Flynn published it through CNAS. Defense Secretary Robert Gates, through his press secretary, said he thought Flynn's findings were "spot on," but he also made it clear that he was uncomfortable with a serving general officer issuing his directives through a Beltway think tank. But by publishing through a think tank, Flynn was able to reach an influential constituency: the foreign-policy pundits, armchair strategists and op-ed writers who could help sell the Afghanistan surge strategy to the public. The general would also reach top policy-makers outside his direct chain of command. The perception of neutrality serves think tanks like CNAS well in other respects. In a December 21 opinion piece for CBS News, CNAS president and counterinsurgency advocate John Nagl and senior fellow Richard Fontaine wrote about the unprecedented role contractors play on the battlefield. While the authors pointed to some of the obvious problems of outsourcing defense, they reached a stunning conclusion. "When our nation goes to war, contractors go with it," they wrote. "We must get on with the task of adapting to this reality." That opinion piece--which followed the release of a CNAS report on wartime contracting--put the think tank's stamp of approval on government outsourcing. CNAS says that corporate and individual donors don't fund individual projects, but CBS failed to mention that companies like KBR were contributing to CNAS's general fund. In an e-mail, CNAS CEO Nathaniel Fick confirmed that KBR had donated $200,000 (as of press time, KBR was not mentioned on its list of donors), and that the center is currently soliciting support from Lockheed Martin, Northrop Grumman, DynCorp and Fluor, all companies that are in the business of "expeditionary support" contracting. "The people we talk to, our corporate funders, are involved in that business," Nagl told me in a recent interview. "We talk to them about the fact that we're doing that project. We talk to them about their perspectives on it--but they don't directly fund that work." CNAS may be nonpartisan, but for contractors, the message was clear. A December 18 blog post on the pro-contractor website Feraljundi.com praised the report, noting that contractor use has actually gone up on Obama's watch. "Yee haw. Finally there is a recognition of that fact over at CNAS, and this paper is proof of that." This is how the Beltway consensus is built: not through some crude pay-for-play but through the subtle reinforcement of conventional wisdom. If the experience of Iraq taught us anything, though, it's that reporters need to maintain an adversarial relationship with the people who are helping to craft policy.